Hey, wow, it’s St Patricks Day already…that one kind of snuck up on me! Happy Paddy’s Day everyone from the crew over here in Dublin. There was great ideas thrown about a few weeks back to do a big Patrick’s Day special over here on the metblog, but, alas, I think we’re all just exceptionally pressed for time. 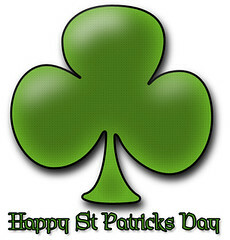 Of course, the best resource for all thing’s Paddy’s Day today is the official St Patricks Festival website, but do also check out Ireland.com’s great Patricks Day section. I have family over from England, so, I think we’ll be braving the typical cold, wet and windy Paddy’s Day weather, and heading out to a parade. We may also make it along to the wonderful Guinness Storehouse, one of Dublin’s greatest attractions. It really does warrant a post of it’s own, so, hopefully I’ll get around to that, with pictures at some stage in the not too distant future. You can always wander along to Tourism Ireland’s Website where a live stream of today’s Dublin City parade is available.